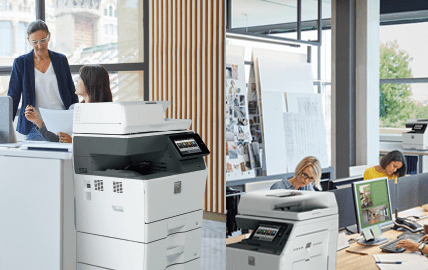 Sharp MFPs are easier to operate, control, monitor, manage and maintain, helping take your business to the next level of productivity and performance. We partner with you to offer a customized strategy for your unique situation, and we ensure that your systems are kept running smoothly. With an ever-growing amount of data, now is the time to eliminate paper-based file storage and reclaim office space for more productivity and efficiency. With our managed print program you get the unparalleled service and support of DTS along with powerful management tools to help you cut costs and increase productivity. A Sharp touch-screen interactive display system can magnify your success, motivate your audience and improve your image. Give your message the impact it deserves. DTS is a leading technology and service provider specializing in copiers & printers, IT services and document management in Minneapolis, Minnesota. We are passionate about delivering dedicated and responsive service to you. We seek to solve the technology challenges of small to mid-size businesses and design solutions tailored to your unique needs. The combination of our dedicated support and exceptional technology solutions will generate the reliability and trust that you need in a valued business partner. Precision engineered copiers & printers help increase workflow efficiency and provide exceptional image quality to take your business to the next level. Experience unparalleled service and support along with powerful management tools to help you improve efficiency and data security while also reducing costs. Improve workflow processes by allowing secure access to information from anywhere. Don’t wait to enjoy all the revolutionary, efficiency-boosting benefits.